New Orleans What kind of social media dog whistle sent out the call? What made the white supremacists and various groups of the alt-right think that somehow Charlottesville, Virginia was the place to make their play? Was this an effort to make a stand or take a big step up in enemy territory? Charlottesville is a smallish, liberal university town. It’s where people in Virginia have gone to embrace diversity, not to run from it. The community organization, Virginia Organizing, is headquartered there. The Thomas Jefferson designed University of Virginia has it’s home campus here. The county went for Clinton in 2016 with 60% to only 34% for Trump. Let’s be clear. This isn’t about Confederate statuary. What had been Lee Park had already been named Emancipation Park. This was a fight already fought and lost. This was all about making a statement because the white-right calculated that they are in ascendancy and wanted to take another tactical step up the ladder to claim a place legitimizing their version of hate and identity-politics gone wild. The call was out. 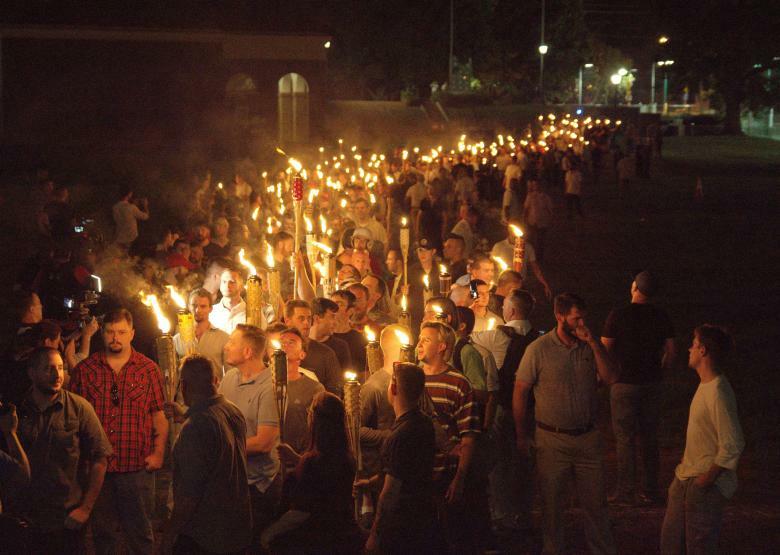 Observers called this the largest white supremacists public rally in recent memory. And, why? Whether you support or oppose him, there’s really no way to get around the fact that they have been emboldened by Donald Trump and his presidency. His lame, limp-wristed, two-handed response blaming everyone for violence, that was clearly provoked and implemented by the supremacists and their supporters, including the weaponized car attack which has killed one protester and injured almost twenty others, can’t be papered over, or perhaps the better word is “whitewashed,” by additional revisions by the White House communications team or his daughter. President Trump didn’t wrong foot his answer. It’s pretty clear he said what was on his mind, and his mind was wrongheaded on this core issue of racism completely. When Attorney-General Jeff Sessions, well-known Alabama racial apologist and whiter-than-white and down with the cause it seems himself, understands that Charlottesville is serious enough that he issues a statement saying the Justice Department is mobilizing to prosecute civil rights violations there, then no one should have needed a weatherman to understand how the wind was blowing. Speaker Ryan called the events “repugnant.” Some understood their cherished, and often abused, “rule of law” was threatened. Yet, President Trump can’t buy a clue when it comes to understanding racism, anti-Semitism, and the litany of alt-right protests on display. Was this Steve Bannon, his chief strategist? Heck, I even think Bannon and his Breitbart crowd are smarter than to show their true selves so starkly. This Trump reality reveal is past politics. He has shown his vacuous core beliefs here, and it is frightening because they are dark and divisive. Charlottesville needs to be a turning point for all of us, and Trump needs to alter his course. Immediately. This entry was posted in Ideas and Issues and tagged Charlottesville, Trump Administration, Virginia, White Nationalists, White Supremacists by Wade. Bookmark the permalink.